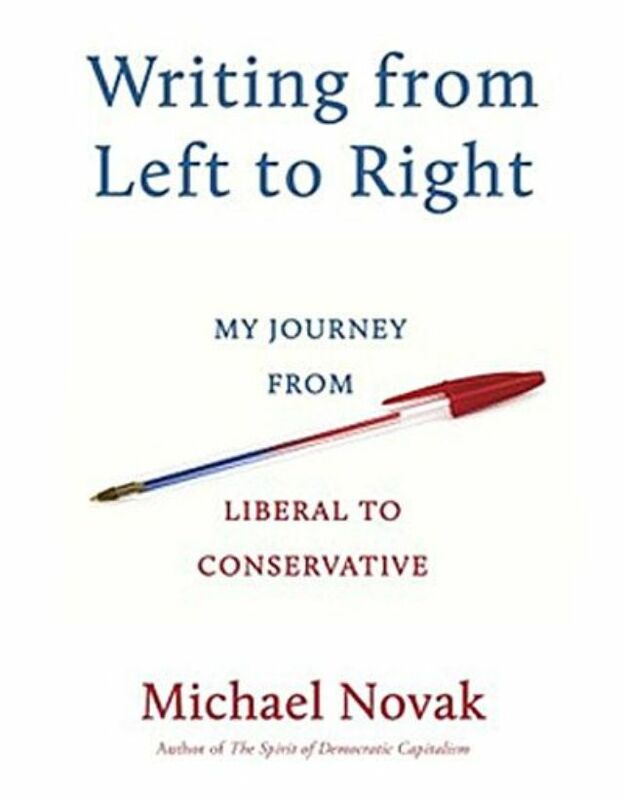 One of the most fascinating and engaging political stories that I have read in years is the recently published book, Writing from Left to Right: My Journey from Liberal to Conservative (Image: New York, 2013). This unique memoir is written by Roman Catholic scholar Michael Novak. I found Novak’s memoir so deeply interesting, for both Christian and personal reasons, that I decided to write several blogs on the ideas of Novak, a foremost intellectual among serious social thinkers over the last four decades. I have followed the work of Michael Novak for thirty years. Michael Novak is the retired George Frederick Jewett Scholar in Religion, Philosophy, and Public Policy from the American Enterprise Institute. He is an author, philosopher, and theologian. Michael Novak now resides in Ave Maria, Florida, where he is a trustee and visiting professor at Ave Maria University. I had the privilege of serving on a national board with Michael Novak in Washington about a decade ago. It was through this context that I got to know him personally. Several shared meals allowed me some access to his mind and life. Then a few years ago I heard him do an evening interview at Acton University where Fr. Robert Sirico asked him about his life’s journey, both personally and intellectually. He was charming and insightful, as I have always found him to be. You may not agree with him on policy, or on the end of his political journey, but you cannot deny that he is a lovely man who thinks and challenges assumptions, both those of others as well as those that have been his own. In heavy seas, to stay on course it is indispensable to lean hard left at times, then hard right. The important thing is to have the courage to follow your intellect. Wherever the evidence leads. To the left or to the right. This memoir is the story of how a friend of liberals and conservatives, and a lifelong Democrat, came to embrace certain parts of the Reagan agenda. Novak is persuaded, as a Christian of deeply formed faith, that providence (not deliberate choice) placed him in the middle of crucial events in his lifetime: a month in war-torn Vietnam, the students riots of the 1960s, the Reagan revolution, the collapse of the Berlin Wall, Bill Clinton’s welfare reform, and the struggles for human rights in Iraq and Afghanistan (these words are taken from the book jacket). Novak is not your typical political conservative. As I have already noted he spent some fascinating times, often in real friendships, with Bobby Kennedy, George McGovern Sergeant Shriver and other leading Democrats of the 1960s and 70s. Then he became a friend of President Reagan, Margaret Thatcher, Vàclav Havel and Pope John Paul II. Each of these friends helped to shape Michael’s story as well as his views on sundry public issues. I want to share a few of Novak’s lessons, and ideas, in blog posts. Today I want to underscore that Michael Novak has lived his entire life with a deep focus on helping the poor and defending universal human rights. This core has never changed, which is one reason both liberals and conservatives ought to listen to Novak. He has more to say, to both sides of this divide, than almost any writer that I’ve read and known personally. Here’s the bottom line – Michael Novak came to see that building small businesses, and envy-free democracies, is the only way to realistically build a free and just society. Without economic growth, from the bottom up, democracies will not be stable. And without solid protections for liberties of conscience and economic creativity, democracies will fail. Honestly, how can we argue with that conclusion even if we do not agree with the means to this end? The debate, for my interest at least, ought to at least start here. Novak says free societies need three liberties in one: economic liberty, political liberty, and liberty of spirit. Not only does Catholic social theory teach the same but all Christians in the West should seriously reconsider these three liberties if they are going to engage in debate about the political means to a more just and free society. This debate is not about the percentages of rich and poor (how this is being used to promote social practice in our time) but rather about the real liberty that we should cherish and protect so it can be used to the advantage of empowering as many people as possible in an open and free democracy. Novak is right to conclude that libertarian, as well as modern liberal economic assumptions, are both wrong. He believes that they are both wrong and often for the same reason – they tilt freedom and justice to an end that does not correctly grasp the better angels of social philosophy. Steven Garber liked this on Facebook. Thanks for these blog posts John. I’ve followed Novak off and on for decades. I will have to add that to my reading list. I loved Michael Novak! Dynamite quote: “In heavy seas, to stay on course it is indispensable to lean hard left at times, then hard right. The important thing is to have the courage to follow your intellect. Wherever the evidence leads. To the left or to the right.” How true!!!!! This is, as you know Greg, is no ordinary “typical” conservative at all. I have again learned so much from Novak.